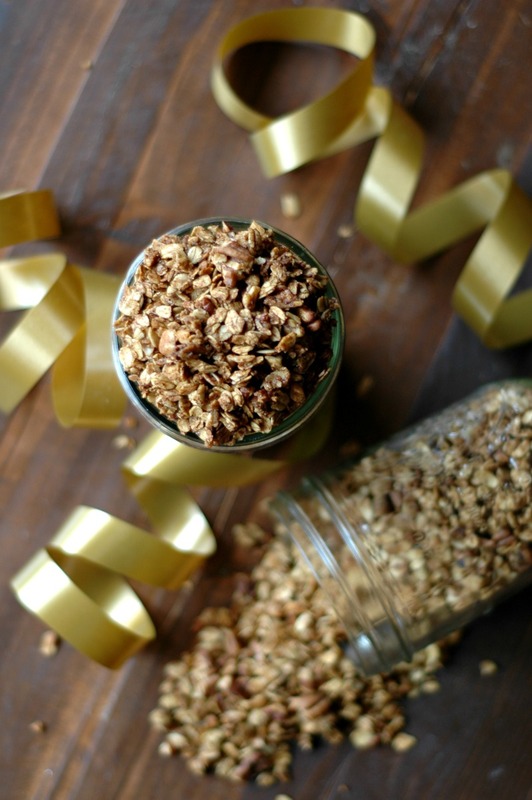 Gingerbread granola is perfect for your last minute gift giving, and a healthier “all holiday season long” breakfast! Oh man, you guys. I am usually never the person to be “last minute” on gift giving, but this whole having 3 kids in school thing has made me…not as organized, ironically! I think I figure I have all this time during the day to get stuff done, and it gets pushed off to get work done, or clean the house, or…well you get the idea! This year I really did think that I had all of my gift set, and then remembered I hadn’t covered all of the teaching staff that our family so desperately loves! Once again, that whole all 3 kids in school thing…times a teacher and assistant in each class, plus office staff and the beloved specials teachers. These people are a part of my village and I love to take care of them! 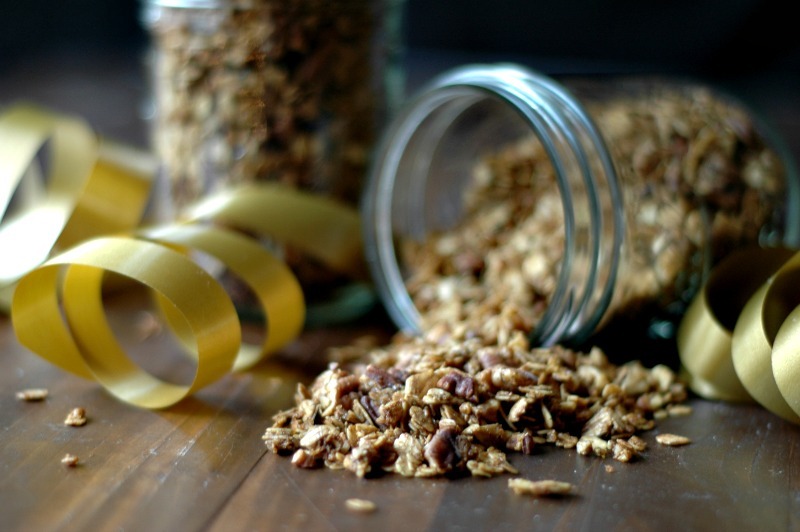 We’ve been jarring up granola for teachers for years – since my 4th grader was in preschool! It is such a simple gift that everyone will love. I always picture these hard working teachers sitting back with their coffee and a big blanket enjoying their first breakfast of the well deserved 2 week holiday break on us! We usually make this cranberry orange granola for Christmas, and this honey rhubarb granola for the end of the school year. It is always so loved, and the girls like making it. Because those well loved recipes require soaking (read, time), and I was short on that commodity, I decided to use sprouted oats, so we could skip the soaking step (if you have regular oats, you can still make this too!). I also didn’t have cranberries or oranges on hand for the cranberry orange granola, and with a little one that had to stay home with an upset tummy, there was no store running on this day. I scanned through my cupboards and when I got to the spices, I hit the jackpot! Gingerbread flavor. 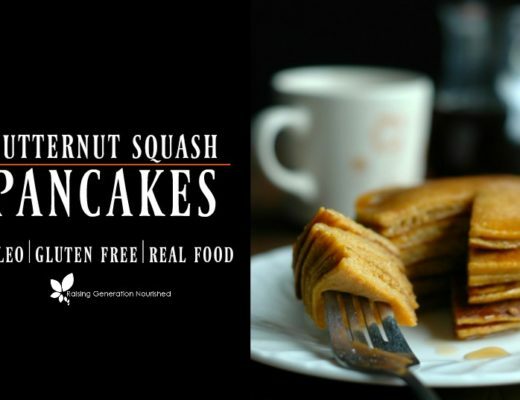 No special store runs – I bet you have all of these ingredients right in your pantry! 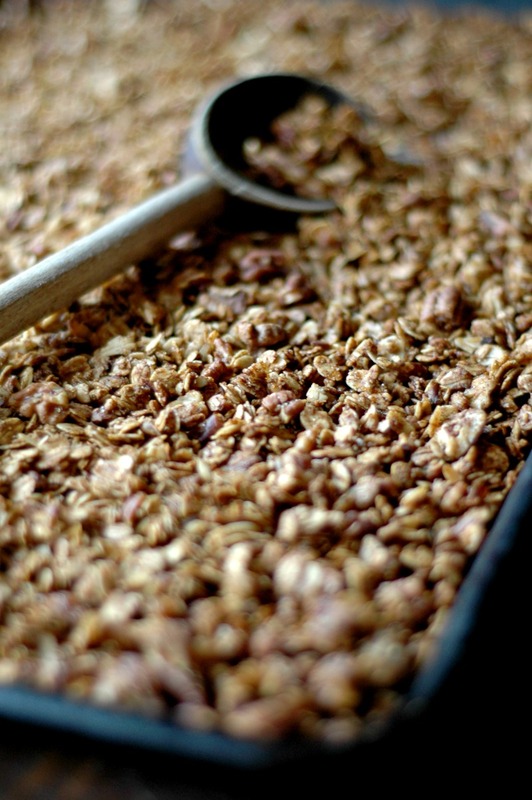 I also decided to forgo the dehydrator and just bake this granola. It went super fast, only taking just over 20 minutes to finish! I had the entire granola mixed, onto trays, and fully baked in a half hour. 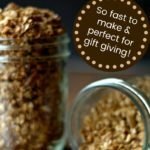 The kids can truly help make this granola from start to finish, and then scoop it all up into mason jars with a pretty ribbon for their teachers. It is so special to be able to let them say “I made this!” when they hand over those jars! Of course, this crazy momma did wait last minute and ended up making it for the girls, but I’ll be having them jar it up and write notes on the jars which is just as special. It is such a simple gift, and so many people get sweets and treats for these kind of gifts – it’s a nice change up to give them something with holiday flavors that can be used as an actual meal! 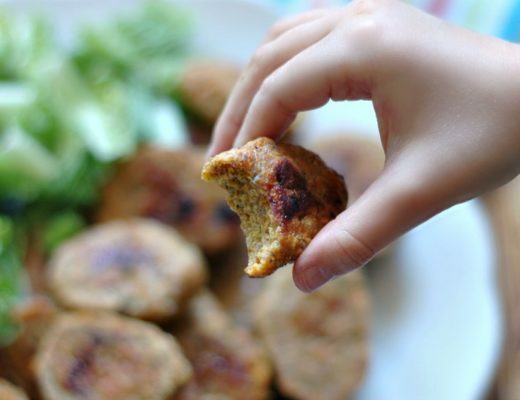 Top your breakfast or snacktime yogurt or coconut yogurt with it! 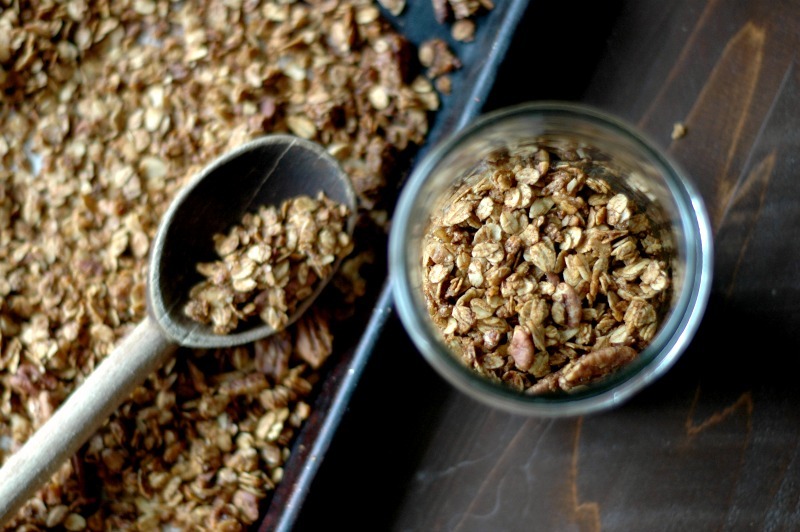 Pour raw milk or coconut milk over a bowl of your granola! Mix it with coconut, nuts, and seeds to make a trailmix for holiday road trips! Pack it up in lunchboxes or morning snack boxes throughout December for a fun Christmas snack throughout the season! If you only have regular oats on hand, I’m totally going to tell you to use them (this is the Non-GMO brand of oats that I use). I would rather you make this with regular oats, then not make it at all and have to buy something for a gift at the store. If you have time to order, we love these sprouted oats, and I keep them on hand for times that I don’t have time to soak. Once isn’t going to be the end of the world not to soak, but over time it is a good idea to eat your oats soaked or sprouted for easiest digestion. This granola is a bit sweeter than I typically make our “everday” granola. When I created this, I was keeping gift giving in mind, which a lot of the times means people that are not used to mildly sweetened foods. I made a second batch for my girls and backed off on the coconut sugar and maple syrup by half and it tastes really good still. Do not back off on the molasses – this is what gives the gingerbread flavor! If you have really little guys around the house that you will be making this for, I would consider backing off the sweet by a bit. As written, this granola totally tasted like a treat to my girls – ha! It is nice a sweet, and perfect for a sour/tart bowl of yogurt. Or to give as a gift to someone who is more used to sweet breakfast cereals. Another year has literally flown by, and I am so honored to continue to be able to write in this space, and share conversation with you all. Healthy and happy new year to you! 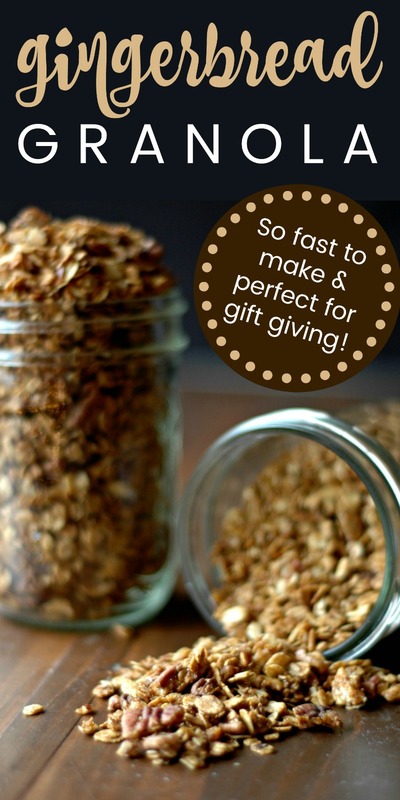 We've been jarring up granola for teachers for years - since my 4th grader was in preschool! It is such a simple gift that everyone will love. Melt the coconut oil, maple syrup, and molasses in a small sauce pan. Turn off the heat, and add the vanilla extract. Combine the rest of the ingredients (the dry ingredients) into a large mixing bowl, and then stir in the melted coconut oil/syrup/molasses, until all of the dry ingredients are coated. 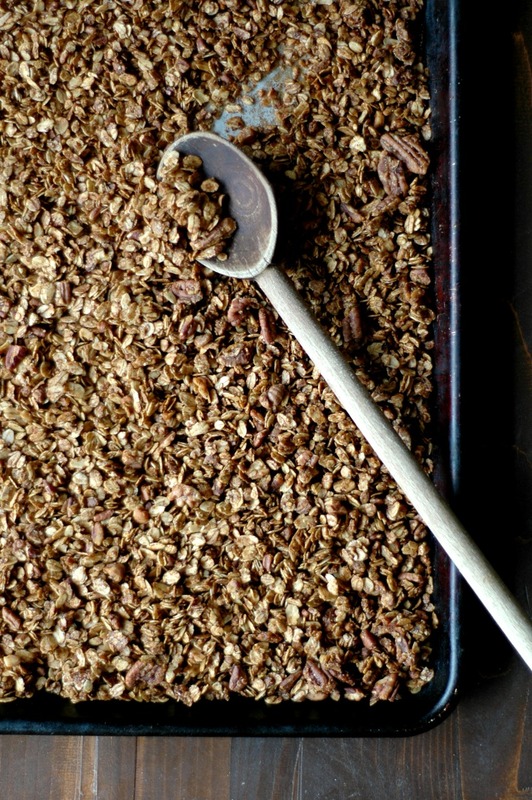 Spread the granola mixture onto 2 large baking sheets and bake at 325 for 10 minutes. Take the trays out, stir the granola, and then return to the oven. Bake for another 13 minutes. 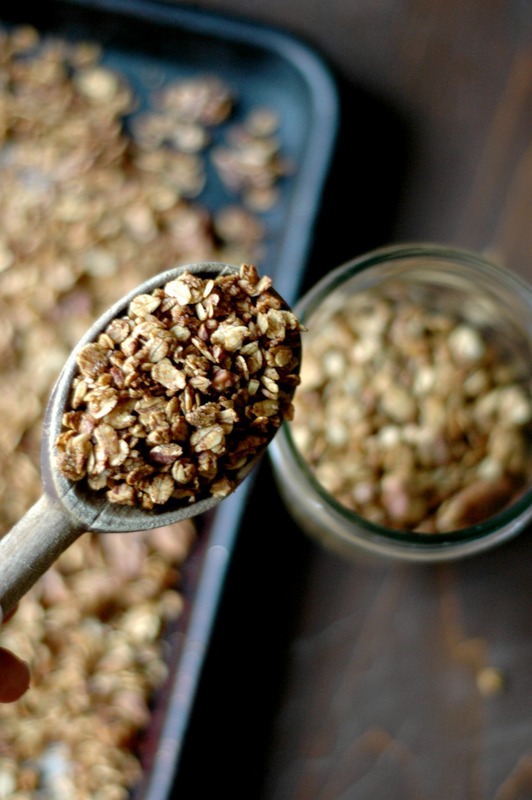 Take the trays out, stir the granola, and then let the granola cool completely. It will crisp up more as it cools. 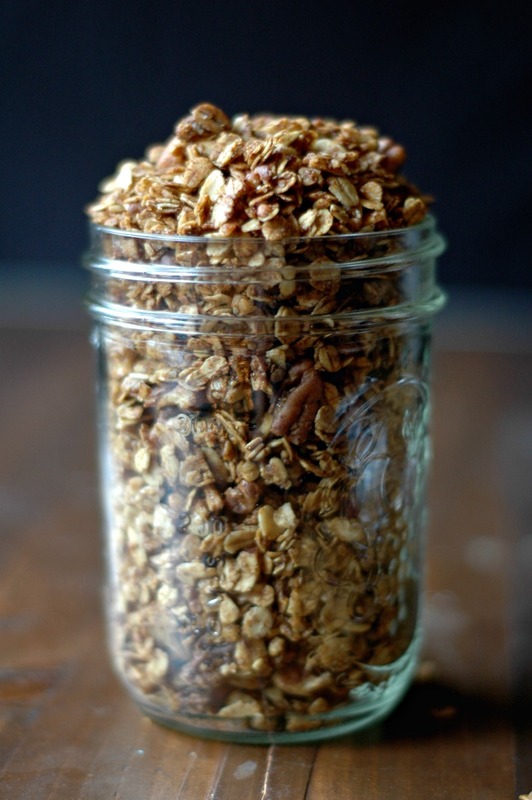 Store your granola in airtight containers up to a month in the pantry, or months in the fridge or freezer. I just love a big bowl of granola, even in the winter. I don’t care if it’s cold. 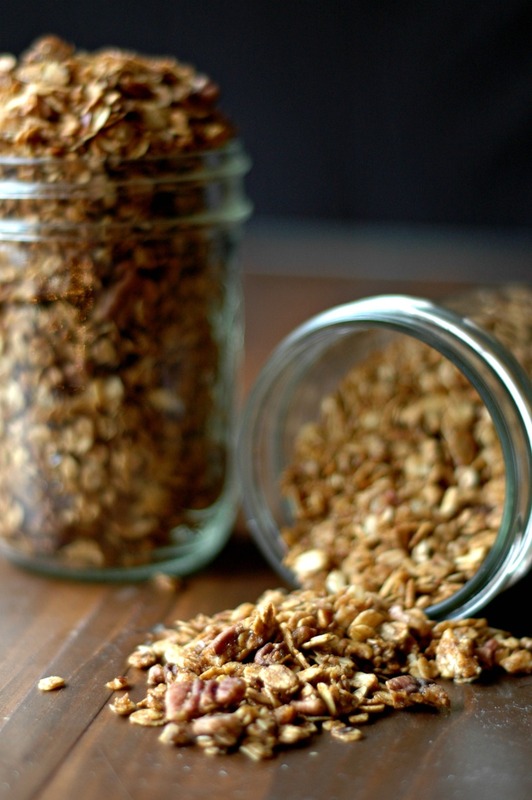 Granola is easy, and once it’s made, I don’t have to think about it. Ginger is a favorite flavor right now, too! Gingerbread is one of my favorite flavors. I bet it’s delicious in granola! 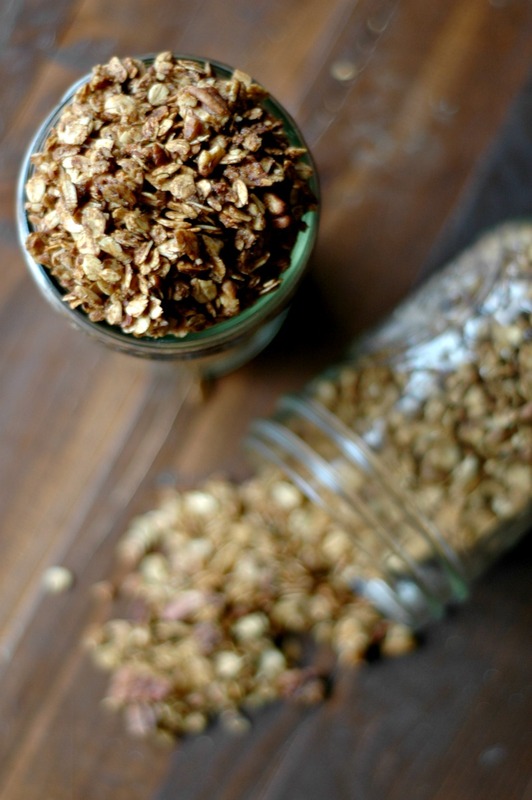 This is a great flavor for granola that my kids would love munching on right out of the jar! Granola is my most favorite snack ever! Looks wonderful! We like things less sweet, so I’ll try your “home” version out on the fam. Looks like a great recipe! Love gluten free granola! Can’t wait to make to top on my coconut yogurt. I love gingerbread flavors so much, so this looks absolutely amazing! I love gingerbread flavor! This would be such a great winter breakfast. What a great flavor for granola! This is the kind I could be addicted to. I love granola in the morning. This recipe will bring new flavor to my morning routine. Lovely! I make my own granola a lot. I love the addition of ginger. I’m going to give this a try real soon!